Right now gold and other metallic finish are very trendy so if you think they’re too bold or daring for you, all we’re trying today is that you should give them a chance. There are a lot of ways to use gold in interior design and decor without creating an opulent or kitschy look. 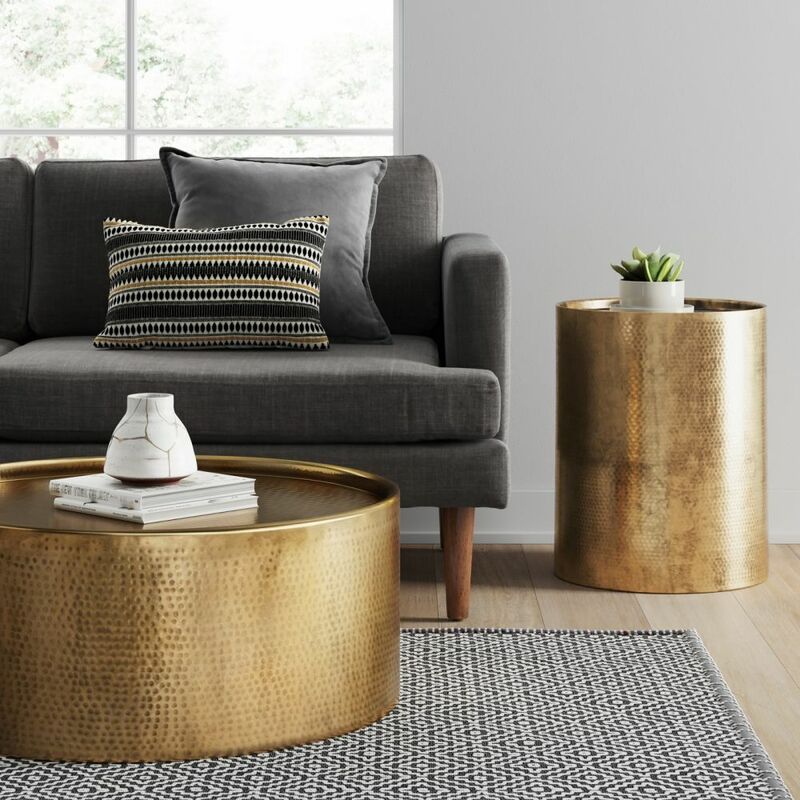 A gold coffee table can, for example, be a stylish focal point for the living room and you can pair it with a simple and classic sofa and a neutral area rug for a nice balance. 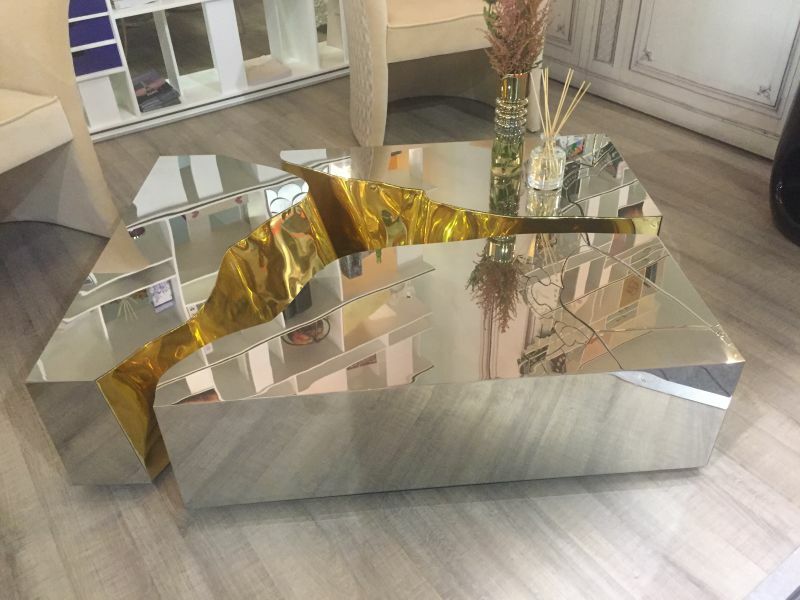 Let’s see what your options are in terms of stylish gold coffee table designs. 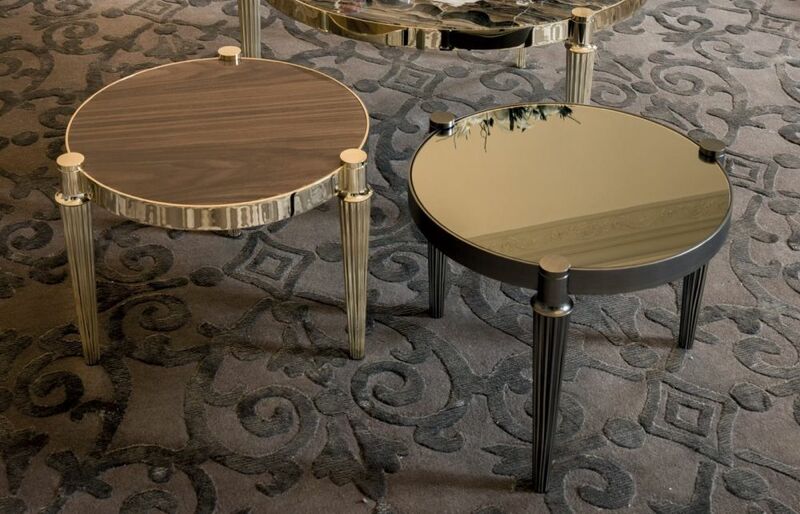 The Empire coffee table is built from mahogany wood and features a polished brass surface with large visible cracks. The cracks are hand-carved and meant to emphasise the organic and natural beauty of the wood. 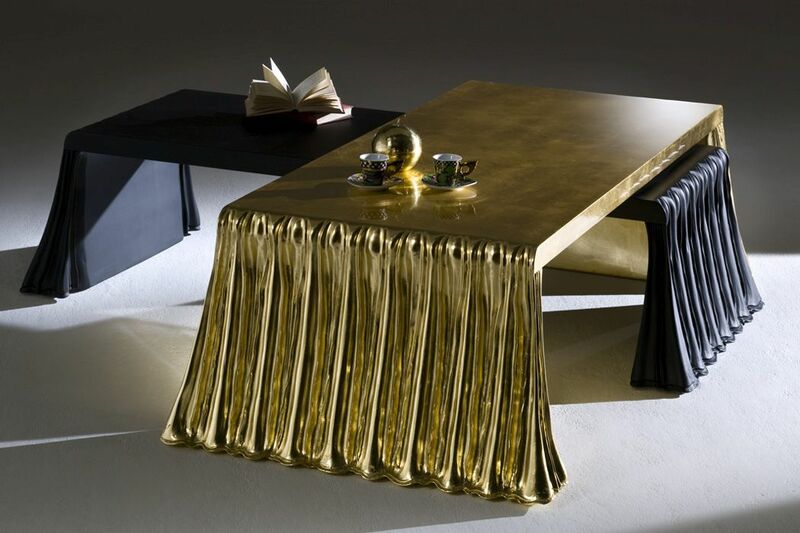 The gold finish details give the table a sophisticated and expressive look. The Eden table is also a refined and luxurious piece designed to reference the tree of knowledge and the concept of desire. It’s made of melted metal with a gold-plated finish. 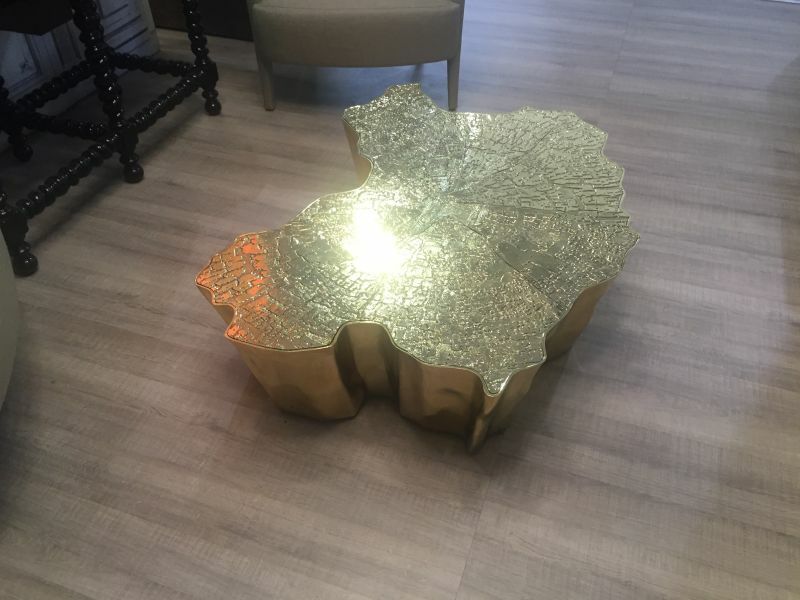 The entire piece is made of polished casted brass and the top is engraved making it look like the table is a piece out of a very old and golden tree. In the case of the Lapiaz table, the name says it all. Lapiaz is a french term which describes a geologic rock formation produced by the dissolution of limestone or dolomite rocks. 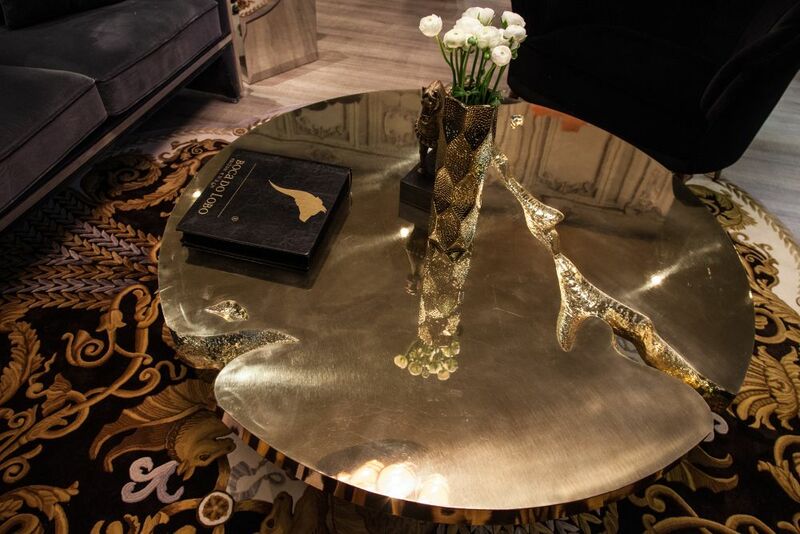 The table captures the beauty of such cracked stone formations, revealing a rich gold interior. It’s important to mention that this table is composed out of three separate modules which fit together like puzzle pieces and is available in several different finishes and combinations such as polished brass and polished stainless steel. 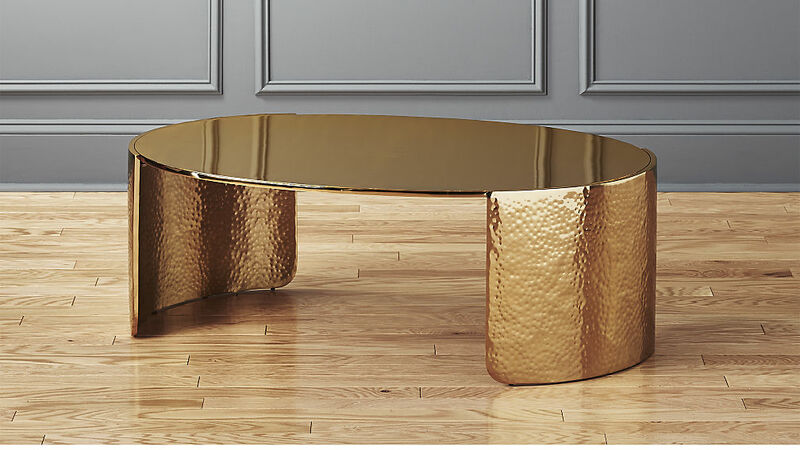 Showing that the inspiration for a great design can come from anywhere, this gold coffee table designed by Brett Beldock was inspired by a Saint Laurent cuff from the ’70s. In a way, it makes sense since furniture is like jewelry for our homes. The design of the table is classy, simple and luxurious, featuring hand-hammered base panels and a stainless steel sheet top with a perfectly smooth and shiny surface. Needless to say, you should use coasters on the Cuff table. The Manilla Hammered Barrel Coffee Table is a very stylish piece with a modern and simple design and lots of character. It’s round and it has a hammered brass finish which gives it a unique texture. The top has a delicate rim which prevents items from falling off, being a sort of built-in tray. Meet Felix, a classy and elegant coffee table with tapered legs and exquisite blends of metal and wood. The frame is available in bright light gold, matte Champagne gold, bright chrome, bright black chrome and matte satin bronze. The top can come in a variety of other options includes glossy and matte ebony, Canaletto walnut, glossily lacquered ivory, bronze and smoky mirror, black glass and ten different types of marble. 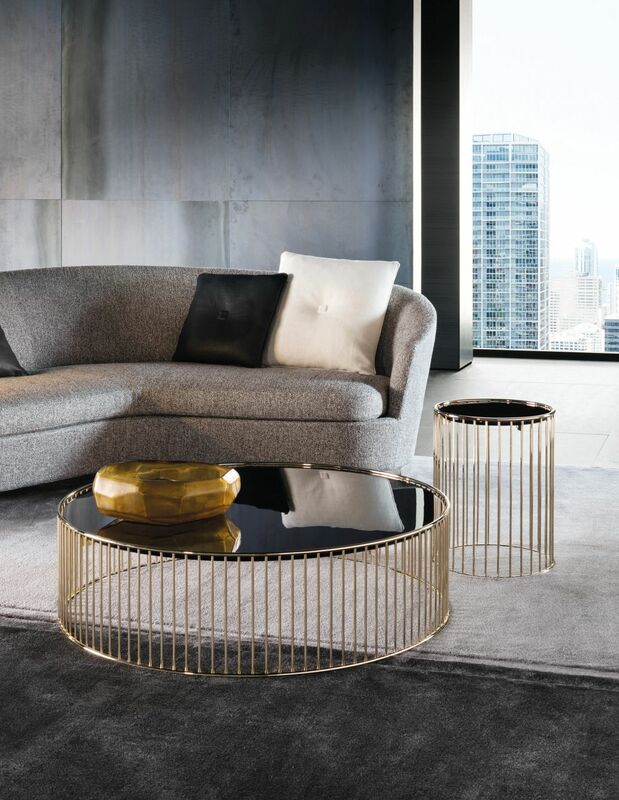 Part of the Milano series, this low rectangular coffee table has a gold leaf finish which gives it an exquisite and luxurious appearance while also highlighting its unique and elegant form. The table looks as if it has a built-in cloth over it except it’s not made of fabric but is a part of the table’s frame structure. This design was created by Statilio Ubiali. The contemporary Caulfield coffee tables are now available in two new finishes one of which is a beautiful polished light gold. This gives the tables an elegant and refined appearance which is further emphasized by the beautiful round tops made of black glass with a lacquer finish. The post Gold Coffee Tables With Trendy And Sophisticated Designs appeared first on Home Decorating Trends – Homedit.